Saw the latest James Bond movie Skyfall this weekend with my weekly Netflix Movie of the Week. All in all a pretty decent flick although it clocks in at 2 1/2 hours. Chop 30 minutes off it and it could be a top 5 Bond movie. As it is maybe top 10. Awesome motorcycle chase scene in the beginning, the end of some characters, a new Q, a reappearance of the iconic Aston Martin and a new Miss Moneypenny makes this a pretty enjoyable movie. Hope I didn't spoil too much for everyone. My favorite Bond movie in quite awhile. Darth Cheney wrote: I like Pussygalore. Without Googling, who played Pussygalore? 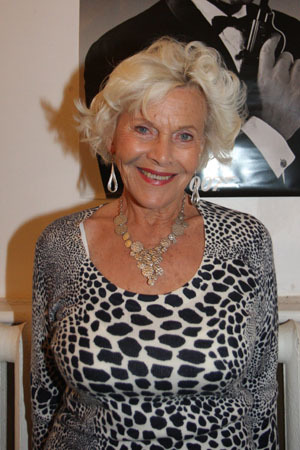 Honor Blackman comes to mind. Skeptical wrote: Honor Blackman comes to mind. Give that man a ceegar!! That bottom pic is Pussynomore not Pussygalore. Darth Cheney wrote: That bottom pic is Pussynomore not Pussygalore. LOL. We should all hope to look that good at 85. Ok, I won't even try to see it now. Actually, because of Twinks comment, I am even more excited to see it. You see, if a flaming lib hates it, it must be GREAT!